Boilerman Ltd would like to help keep you safe and warm all year around. Our office is manned Monday to Friday, 8:00 a.m. to 4:00 p.m. so please do give us a call to talk to our friendly team. Alternatively, if your query is not urgent or it is easier for you, please use the enquiry form below to contact us. 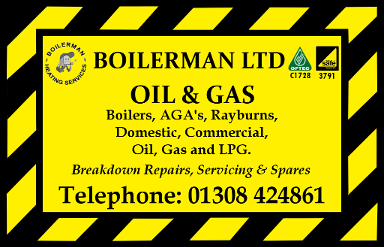 Please note that if you do have a boiler breakdown, please make sure to ring our office on 01308 424861. If our phone line is busy, we are experiencing a high volume of calls. Please leave us a message and we will attempt to call back within half an hour in normal office hours. Please be advised that at 4.00 p.m our telephones cuts straight to the answerphone immediately, this is to allow our staff time to order parts for clients and addressing email queries. We look forward to talking with you! Sharon, Amity, Becky, Karen and David for Boilerman Ltd. Note: All telephone calls are recorded for the purposes of training and for verbal authorsiation of works. We always endeavour to provide the best service and products for our customers. However, on rare occasions, we recognise that there may be times where our customers may not be completely satisfied. To ensure we are able to put things rights as soon as we can, please read our complaints procedure below and we will respond promptly to ensure complete satisfaction. As soon as possible after the completion of the works, please inspect the work to ensure everything has been carried out to our usual high standards. In the unlikely event there is anything you are not completely satisfied with, please contact us as soon as you can in order that we can rectify any problems as soon as possible. Where we cannot resolve any complaints using our own complaints procedure, as a Which? Trusted trader we use Dispute Resolution Ombudsman for dispute resolution. In the unlikely event of a complaint arising and you wish to refer the complaint to them please contact us on 0117 981 2929 or via their website http://www.disputeresolutionombudsman.org/which-trusted-traders-partnership/.